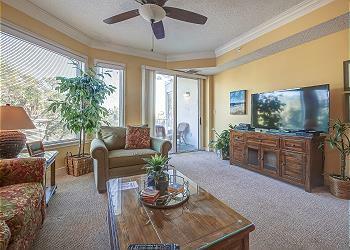 Wonderful 1 bedroom, 2 bath villa is on the 3rd floor in building 2 at the SeaCrest Resort with angled ocean views. The updated fully-equipped kitchen offers new stainless steel appliances and a beautiful backsplash. The breakfast bar comfortably seats 4. The living area is bright and cheery with premium hardwood floors. The king bedroom boasts a large walk-in closet and private bath with walk-in shower, garden tub, and double vanity. This is the perfect villa for your vacation!